For us, last Saturday, we went south. Shining up the convertible and cruising top-down along Highway 1. We’ve done drives all over the world (for example see New Zealand here, and Scotland here) and the drive from San Francisco to Big Sur remains my favorite scenic escape. 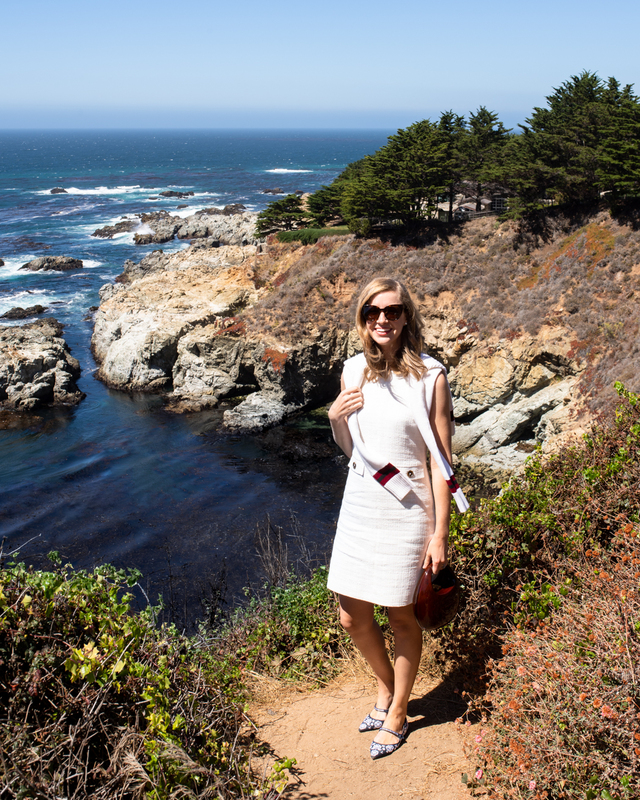 Our friends, Fraser and Lauren, were getting married on a private estate overlooking the Pacific and we made a day of it. Balancing a thermos of coffee in my lap I tied a scarf around my head in an effort to save my blowout for the wedding later that evening. Lucky for us (and the bride and groom) the weather couldn’t have been better. A thick, soggy marine layer (also known as “fog”) is the norm on the California coast, but the sun was out last Saturday making me regret my lack of sunscreen. 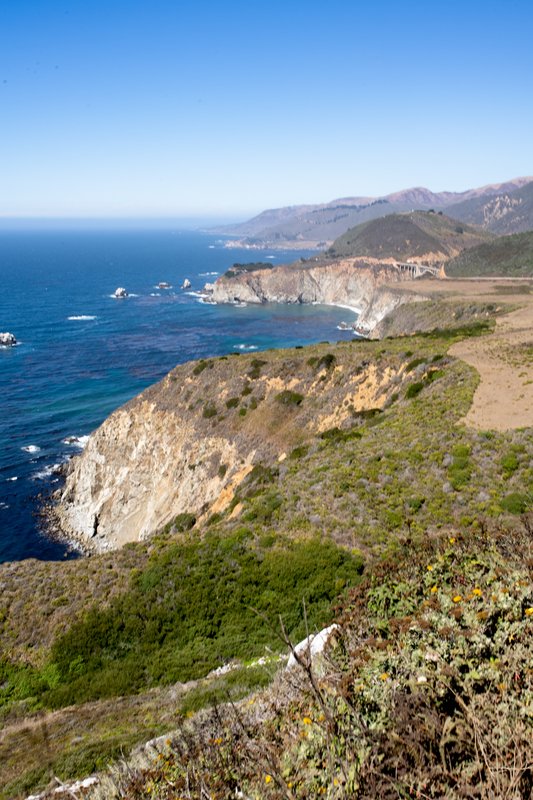 If you start early enough, you’ll get going before the nose-to-tail tourist train is on the road and feel like you have all of Big Sur’s majesty to yourself. Unfortunately this is not what we did. 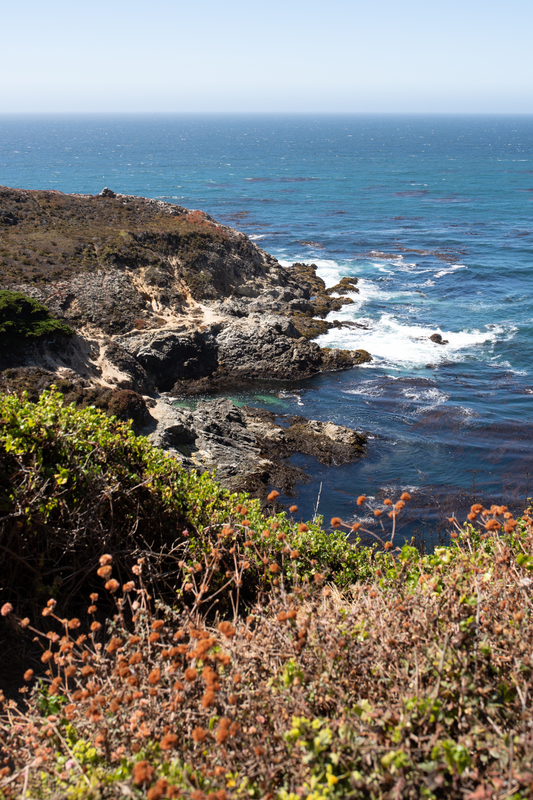 We left at 11am and found ourselves in the thick of it, but the many tiny pull-offs along Highway 1 will always give you the chance to hike down a bit and recapture that feeling of having it all to yourself. These photos are from one random stop and proof that wherever you pull off it is just gorgeous. 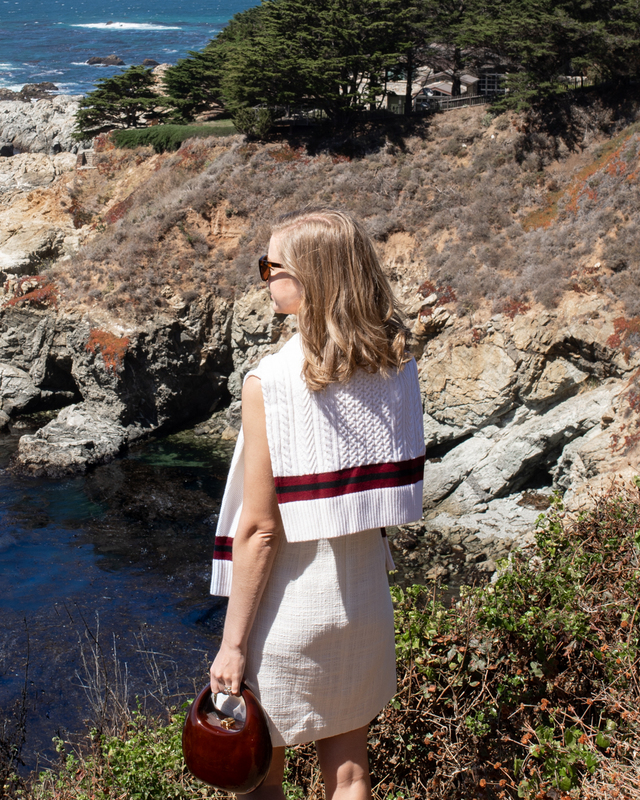 I have been buying and loving shift dresses from Brooks Brothers’ Red Fleece Collection all summer (last seen here) and was excited to wear this white boucle shift and tennis sweater they sent me for our drive. I don’t know how they pull it off, but Red Fleece delivers the same incredible quality Brooks Brothers is known for at a fraction of the price of their normal line. Their shifts are cut just right to be comfortable-yet-flattering, and this tennis sweater is going to be a closet staple for years to come. I’ve been looking for a tennis sweater for months (years?) and this one is just right with slim arms and a slightly looser fit at the torso – and only $88. 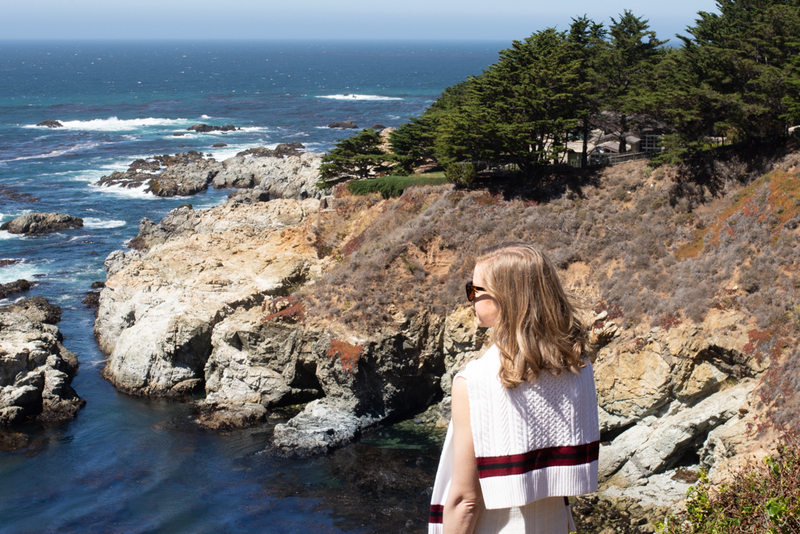 A classic look for an iconic California drive! Arriving in Pfeiffer Big Sur State Park we refueled with the best iced tea and pistachio & cherry scones at Big Sur Bakery before changing for the ceremony. You can see the stunning views from their wedding in my Instagram stories now if you’re quick! These photos are just stunning. 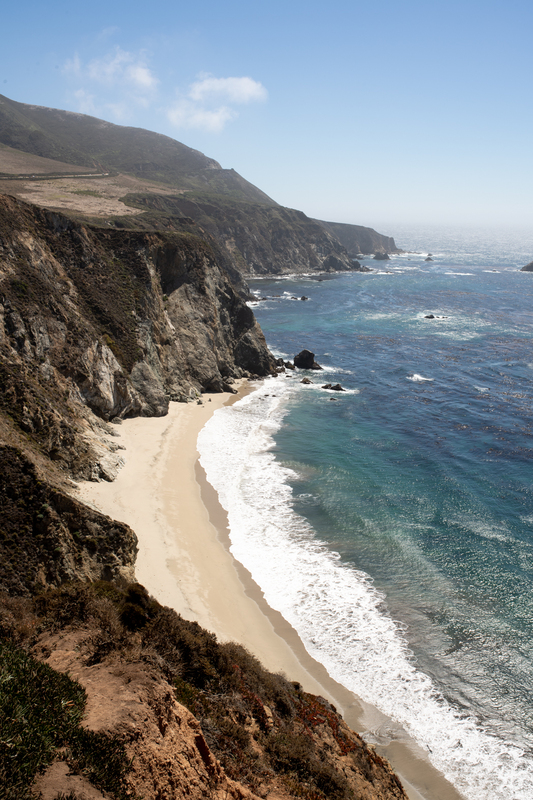 I’m dying to go to Big Sur! I went for my honeymoon, it’s just so beautiful!